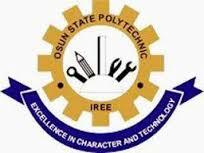 Osun State Polytechnic, Iree (OSPOLY) Daily Part-time Orientation Programme Dates, Time and Venue for Newly Admitted ND1 Students for 2018/2019 Academic Session. This is to inform all Osun State Polytechnic, Iree (OSPOLY) Daily Part-time ND 1 students that the Orientation Programme Schedule for the academic session of 2018/2019 has been announced. The Directorate of Student Affairs is organizing a four-day program for 2018/2019 DPT ND 1 Students. The programme, apart from being mandatory for the newly admitted students to attend, it is also educative and instructive. The issues relating to the academic and social needs of the students while on campus would be treated by the invited guest speakers at the events.